As mid-sized scooters sell by the thousands every year, BMW decided to enter this market. The Germans came up with the C400X, a new scooter, aimed to make the life of commuters comfortable inside the city. Let’s take a closer look at the BMW C400X to see how the scooter will perform on the streets. The Germans gave the C400X a sporty look so that it is aesthetically appealing to its customers. The scooter comes with a telescopic front fork for the front suspension with double shocks in the rear. Taking this scooter through the roads of your city will be a delight, as the suspension can absorb the vast majority of bumps without any problems. In the front, you will find double disc brakes with four-piston callipers. At the rear, BMW fitted a single disc brake with single-piston floating calliper. The brakes provide adequate amounts of stopping power, allowing you to bring the scooter to a quick halt at every speed. Along with the ABS, you will feel the scooter to be safe and within your control at all times. As the C400X is a scooter, it is vital BMW gets the manoeuvrability right, as it determines whether the machine will be a success in the market. The Germans have gotten handling spot on, as the scooter is easy to ride on city roads. With a small turning circle, navigating the machine through traffic is extremely easy. If the roads are twisty, you won’t face any problems on this scooter. To ensure that the scooter is agile and short, BMW had to restrict the amount of leg room you get at the front. However, BMW provided footrests, as a workaround for this problem. Also, the design of this element provides additional protection against rain. The scooter comes with a TFT display, to which you can connect your phone. The navigation system on the scooter displays arrows, indicating which turn you have to take on the road. Also, with a Bluetooth intercom on your helmet, you can make/receive calls and control the music through the scooter’s multi-controller. 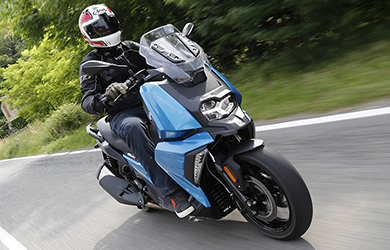 The BMW C400X comes with a four-stroke, single cylinder, four-valve, water-cooled, 350 cc engine, producing 34 hp of power at 7,500 rpm and 25.81 lb-ft of torque at 6,000 rpm. BMW has managed to eliminate the vibrations produced by the engine, by mounting it on rubber bushes. The new engine gives you the best of economy and performance so that you have a wonderful experience with this scooter. With a 12.8-litre fuel tank and fuel economy of 80.7 mpg, you can cover over 200 miles easily. Overall, the C400X is a great mid-sized scooter from the Germans. BMW have gotten the suspension, engine, handling, and brakes right, as the machine performs brilliantly on the roads. Although the scooter will only be available on the UK market in October, the price is expected to be a bit above £6,000. With high build quality and optimal performance, the C400X is a great scooter for your daily commute!